With it‘s bleak concepts, black humour, non-linear narrative, convincing script and the occasional superb output of violence - bordering on squeamishly cartoon and ultra realistic, Watchmen makes for a very entertaining two and a half hours without - thankfully - overly pandering to the tent pole crowd. Everything on the surface points to it being a blockbuster, but it is not what you would expect. It comes across a dystopian offspring of The Dark Knight and Alfonso Cuarón’s Children of Men, and though it never tries to bury it’s comic book origins, it ultimately still feels more sci-fi than fantasy. Having never read the graphic novel, I can only applaud director Zack Synder for being able to achieve a certain reality here though. The Watchmen universe is a beautifully overcast one that from the first frame in The Comedian’s apartment or the outstanding history montage that is the opening credits - complete with Bob Dylan crooning “The times they are a-Changing” (a sign of things to come for the film’s unconventional but outstanding soundtrack), has you rooted in it’s sense of place almost as quickly as a Dr. Manhattan teleportation. Set in an alternate 1985 to our own, with none other than Richard Nixon sleazing his way through a third term as US president, the world is on the brink of nuclear war with both Russia and the US having their fingers poised on the buttons. From the start of the film, we are already at “five minutes to midnight” - midnight being the point at which war is unavoidably imminent. Amongst all the chaos of this and an already turbulent world history, a story unfolds of a group of costumed vigilantes that has been active since the 1940’s. 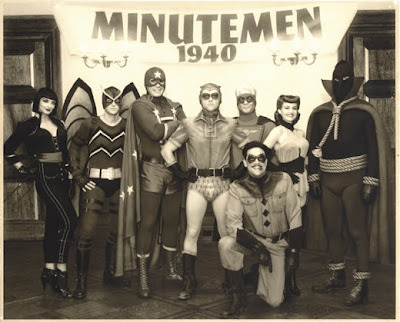 First branded as the Minutemen and later, when a new younger group take the reigns, the Watchmen. However, by the time the cold war story takes focus, the Watchmen have completely disbanded after being outlawed. One of the most recognisable of them is Eddie Blake aka The Comedian. His history is relevant to the story in sutble ways, and things are set in motion after he is brutally murdered in the opening scene. Dr. Manhattan is also a key figure - one who glows blue and has the perceived ability of a god after an accident changed him from a normal man to something otherworldly prone to helping the government get out of a bind (the Vietnam war for example). The film eventually expands into much broader territory beyond the Watchmen themselves, despite them staying completely central to it all. The story in fact is so encompassing, I will not even try to summarize it all, even if as some say, it couldn’t possibly be as deep as the much lauded source novel. The casting proves to be spot on with almost everybody a seemingly perfect fit for their respective roles, particularly Patrick Wilson as the almost too-sensitive Nite Owl, and the brilliant Jackie Earle Haley as the hard-as-nails Rorschach. Some scenes or lines do fall a bit flat - while it is impressive to hear Rorschach yell “I’m not locked in here with you, you’re locked in here with me!” during a prison scuffle for example, it’s impossible to not cringe slightly at the same time, but it surely comes with the territory. By deconstructing (amongst other things) the superhero concept the way he has, Alan Moore’s Watchmen is a unique beast, and even though I’ve never put much stock in Zack Synder as a filmmaker before, he clearly has stepped up and proven that he is capable of handling the material. I wait anxiously for the director’s cut to make the film feel even more complete, as watching the movie, and especially during the second half, it becomes clear that Synder’s true vision has been cropped down with a few parts feeling not only rushed, but almost out of place. These are trivial flaws but a director’s cut will no doubt give an even fuller, more rewarding film experience. The overall ideas and concept of Watchmen may have stemmed from Alan Moore’s book, making comparisons here unfair, but the film, as Zack Synder’s Watchmen, is a worthy achievement that seems to have done the impossible: something that can be enjoyed by those familiar with the source material and those that are not. It can be heavy going at times for someone expecting say, Ironman, but overall, it works despite probably not being as philosophical as it wants or deserves to be.